Since the Georgian era, Mayfair has been one of the most prestigious places to live in London. And during the Georgian era, Berkeley Square was one of the most desirable addresses. Berkeley Square is actually an oblong garden that was, and is, surrounded by residential and commercial buildings. It’s named after John Berkeley, the 1st Lord Berkeley of Stratton (1602-1678). When Lord Berkeley built his town home on Piccadilly in 1675 for £30,000, he purchased the adjacent land north of his property. In 1692, Berkeley House was sold to William Cavendish, the 1st Duke of Devonshire and the house was renamed Devonshire House. 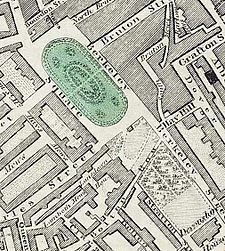 From this 1830’s map, you can see the relationship between Devonshire House and Berkeley Square. The five acres that encompass Berkeley Square were designed in 1730 by William Kent and is home to approximately 30 Maple trees. An equestrian statue of George III originally sat in the square, commissioned by his daughter, the Princess Amelia. The statue was removed in 1827 due to structural problems and a gazebo was erected on the site. 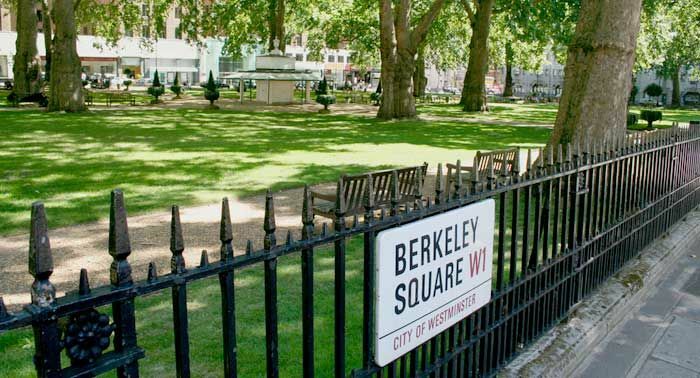 During my last visit to London, I stayed near Berkeley Square and took frequent walks around the Square. Sadly, only a few of the original buildings remain. Lansdowne House is one of those buildings, except the structure has been altered over the years. It is now an office building and private club. It stood next to Devonshire House until that building was torn down in 1920. 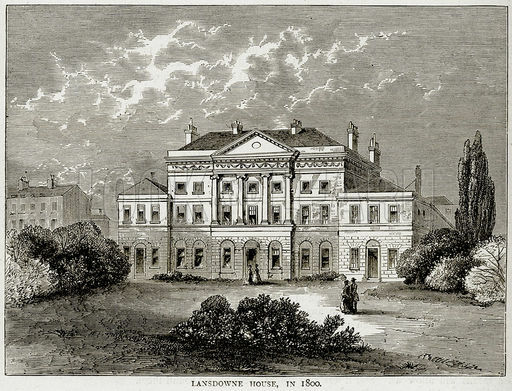 Lansdowne House was designed by Robert Adam for Prime Minister John Stuart, 3rd Earl of Bute. In 1765 it was sold, unfinished, to William Petty-Fitzmaurice (1737-1805), Earl of Shelburne, later 1st Marquess of Lansdowne and a leading Whig statesman of the period. His home was a popular meeting place for social and political circles. Information on the dining room of this home can be found elsewhere on this website. And speaking of dining, Gunter’s Tea Shop was a fixture on Berkeley Square beginning in 1757. This shop was housed in Nos. 7 and 8, and was one of the finest confectioners in London. They sold syrups, candied fruits, cakes, biscuits, ices, delicate sugar spun fantasies, and elaborate table decorations. In addition to eating your ice or ice cream inside the shop, you could also order from the convenience of your carriage. A waiter would bring your order out to you, giving you the opportunity to eat your treat in your carriage under the shade of Berkeley Square. 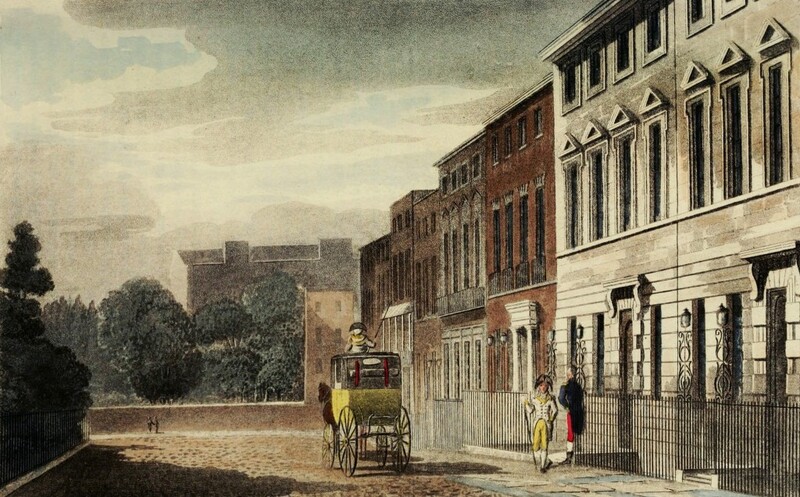 It was a popular destination during the Regency era, since it was the only establishment in London where a lady could be seen eating alone with a gentleman who was not her relative, without it harming her reputation. Another business located on Berkeley Square belonged to cabinetmaker John Linnell (1729-1796), who occupied No. 28. He was one of the first English furniture makers to be educated in design, studying at St. Martin’s Lane Academy. During his lifetime, John Linnell produced high-quality furniture that rivaled other leading craftsmen of the day such as Thomas Chippendale. 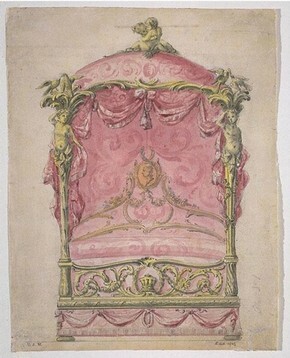 Aside from producing beautiful furniture, Linnell submitted designs for the State Coach of George III and produced the designs for the boxes at Drury Lane Theater. These boxes might have been occupied, at one time or another, by some of his notable neighbors. 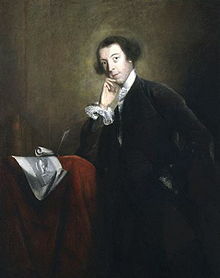 Horace Walpole, the Whig politician, lived at no. 11 from 1779 until his death in 1797. No. 38 was the Jersey Residence. 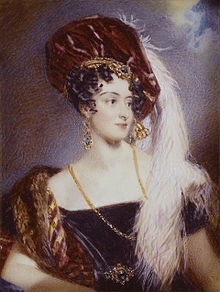 On May 23, 1804, in the drawing room of that home, Lady Sarah Sophia Fane, the daughter of the 10th Earl of Westmorland, married George, Viscount Villiers, and became Lady Jersey when her husband inherited the title. She was a patroness of Almack’s and a prominent figure in Society. Her Berkeley Square town house was her London residence throughout her marriage, and she died there in 1867 at the age of 81. 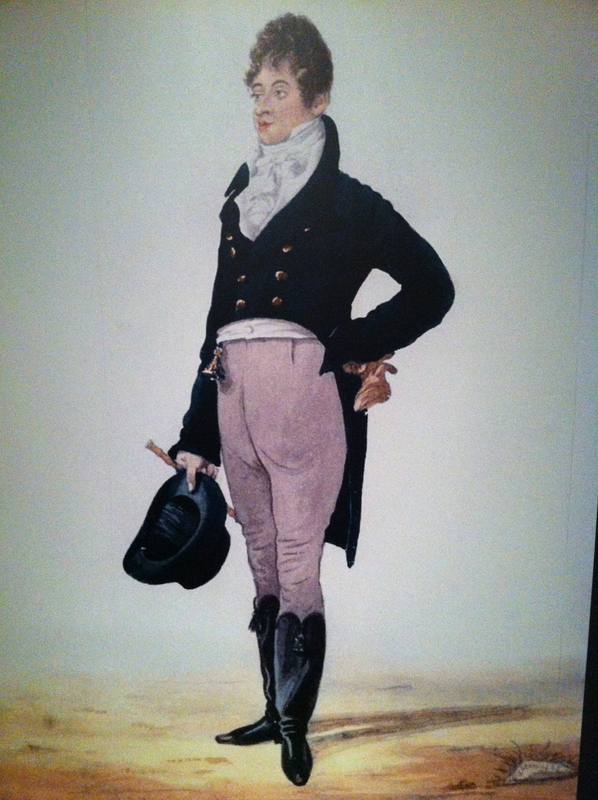 Beau Brummell, the arbiter of men’s fashion, lived at No. 42 in 1792. No. 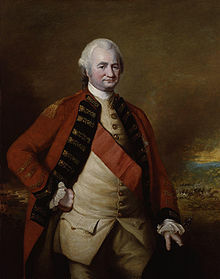 45 was home to Major-General Robert Clive, 1st Baron Clive, (1725–1774), also known as Clive of India. He was a British officer who established the military and political supremacy of the East India Company in Bengal. He’s credited with securing India, and the wealth that followed, for the British crown. After returning home, he sat as a Tory Member of Parliament. In 1774, Clive died in his Berkeley Square home. There was no inquest into his death, however there was speculation he died from a self-inflicted wound or an overdose. 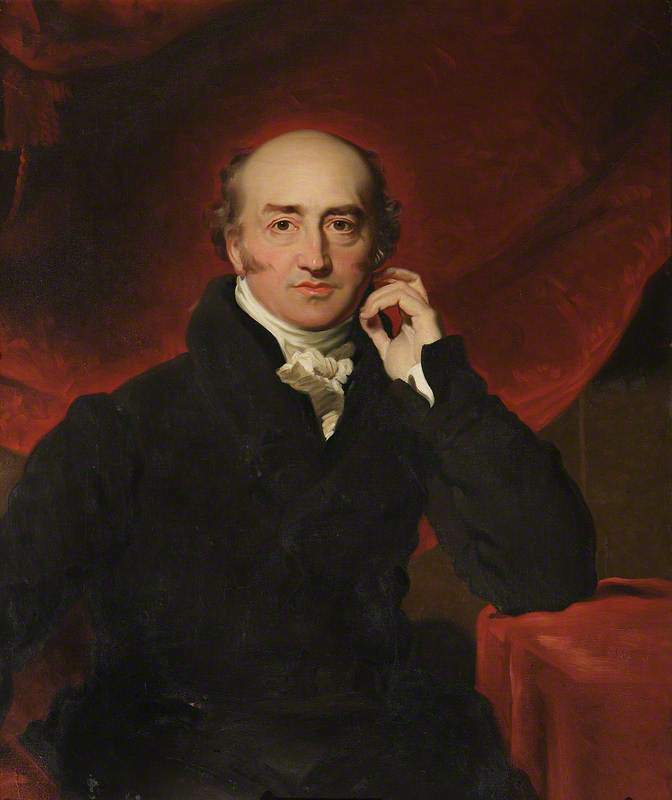 A few doors down, the Right Honorable George Canning, a former Prime Minister, called No. 50 his London home, until his death in 1827. It was then leased by a Miss Curzon, who lived there until she died at the age of 90. 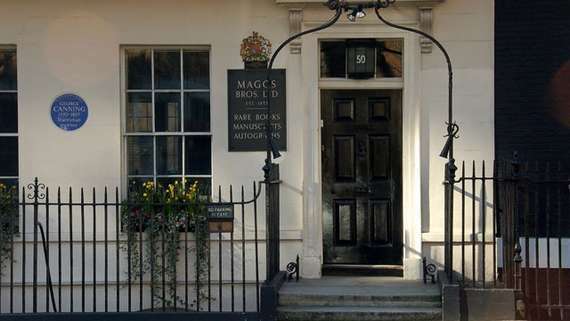 The next resident is responsible for giving this house its reputation as one of the most haunted houses in London. A Mr. Meyers was soon to be married and took possession of the house, furnishing it for his bride. Shortly before the wedding, the woman jilted him. He moved into a tiny room at the top of the building and shut himself off from the world. Years later, a number of people died while spending time in that room, and in each instance their deaths were preceded by terrible screams. If you want to read more about this haunted house, check out the 50 Berkeley Square website listed below. And if you are every around Berkeley Square, you might want to look for No. 50. The house is still standing.